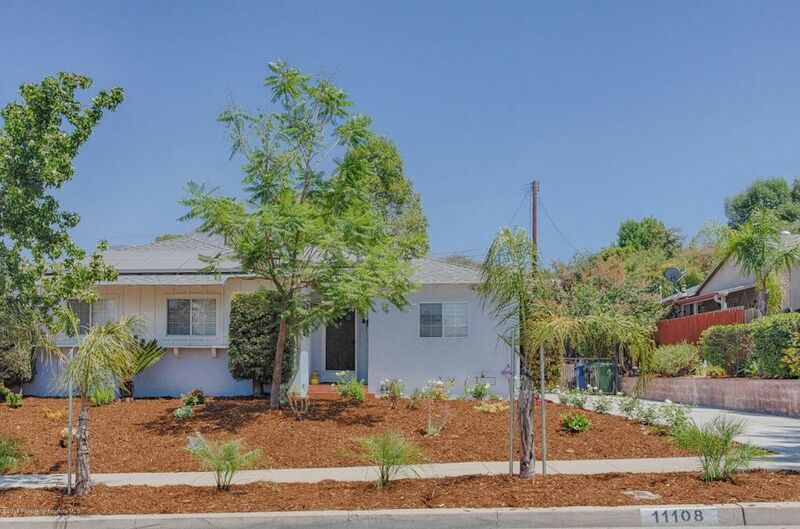 This charming home is located on a very quiet street in North Sunland in the Ellenbogen neighborhood. With scenic views of the local hills from front and back yards you will love the curb appeal. Enter thru the formal entry into the entry hall. The spacious living area is open and includes the living room, dining room and family room. The living room and dining rooms feature hardwood floors. The kitchen is bright and spacious with ample counter space and cabinets. Entertain family or friends in the living space or wind up in the kitchen or move the party out thru the french doors to the backyard!. The backyard is spacious and features an arbor and low-maintenance landscaping. Plenty of room for a pool, gardening or a lawn for the kids. Just beyond the backyard are two bonus rooms which could be an office and a 4th bedroom. Back inside the house the master bedroom features a 3/4 bath and hardwood floors. Other features include central a/c, double detached garage, a gated driveway and backyard a solar electric system and lots of off-street parking.